In partnership with National Geographic, the Chasing Ice Ohio Tour shared the story and visual evidence of our changing climate to central Ohio residents through free screening events that provided climate education to the public. Our goal was to support Congressman Tiberi through the voice of his constituents, and provide him with the information he needed to understand and embrace climate-change science And it worked. The Chasing Ice Team thanks Congressman Tiberi for his updated comments, yet there is still more work to be done. This Tour serves as a case study for what can happen when constituents use their voice and connect with their political leaders. We encourage the constituents of Ohio District 12 and citizens nationwide to continue to share their voice with their elected officials. That is the only way we can address the reality of climate change. -There have been over 90 screening presentations hosted in central Ohio. -8,035 residents of District 12 and surrounding areas have attended screening events. -Marketing and networking events have reached an additional 1,405 Ohioans. -In total 9,440 central Ohio residents have learned about how climate change is impacting Ohio. 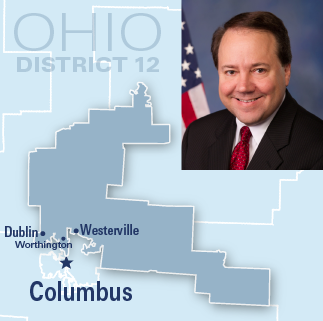 -Over 300 Ohio resident's have shared their messages with Congressman Tiberi. -Press and media have real eased over 35 articles or event announcements about the Ohio Tour between April-May 2014. -Collaboration from over 70 local venues/ organizations, as well as 8 national collaborators represent a wide range of concerned citizens. -Organization that have joined the movement include many different faith-based communities, 6 high schools and 7 universities, 4 rural and urban farming organizations, 7 art and cultural venues, and 46 various other non-profits, local libraries and communities venues. -The Chasing Ice team and local collaborators have distributed 5,500 copies of the Chasing Ice DVDs that feature a written call to action specifically created for Ohio residents.